This dressing table/desk consists of a finely carved and lacquered upstand to the back with floral and foliate decoration with and an egg and dart carved moulding to the top and bottom, each corner having a carved gilt truss bracket. The top consists of a fine quality Chinoiserie design on blue ground with gilt and lacquered decoration of a typical Oriental scene consisting of a weeping willow tree on an island to the centre, landscapes with trees, figures in the foreground, temples and birds etc. with a decorative geometric border and superb leaf design to the front with a finely carved gilt moulded edge. 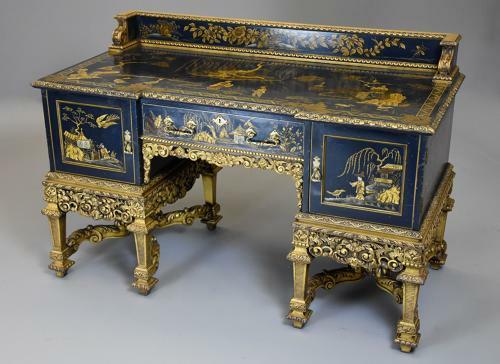 This leads down to the front consisting of a central recessed cockbeaded and mahogany lined drawer with Oriental lacquered drawer front with central brass escutcheon and brass swan neck handles with a carved gilt gradrooned edge above a finely carved and pierced frieze to the knee hole. The drawer has a cupboard to either side, both with a Chinoiserie panel to the front depicting Oriental scenes with brass drop handles and carved gilt moulded edge, the sides decorated with gilt and lacquered floral and foliate designs. The piece is supported on a superbly carved and highly decorative Charles II style base consisting of a carved and pierced foliate frieze leading down to four tapered and moulded legs to each side supported by a finely carved stretcher and central carved boss. This dressing table/desk is in very good condition for age, is of stable construction and can go straight into home or office etc.